THE HUDSON REPORT: Argentina gets biggest IMF loan in history. July 9, 2018. 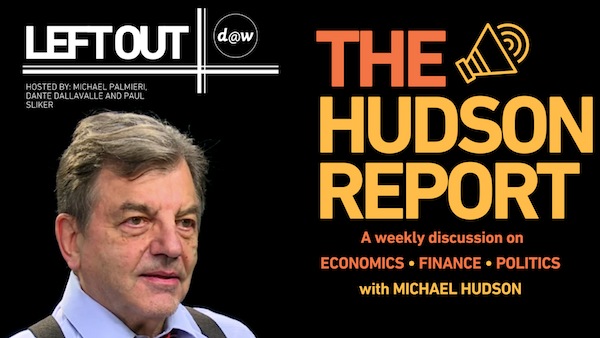 Paul Sliker: Michael Hudson welcome back to the Hudson report. Michael Hudson: It’s good to be back. Much has happened while I was away for a few weeks. Paul Sliker: Michael, Argentina recently agreed to a $50 billion loan from the International Monetary Fund. That’s the largest ever in IMF history. It is supposed to run for 36 months. Argentina began talks with the IMF last month, after three central bank rate hikes. Despite pushing borrowing costs above 40%, this failed to stop the fall in the peso, which has now fallen by 25% against the US dollar this year. This agreement brings back a dark history for most Argentinians regarding the IMF’s role there during their devastating economic crisis in 2001-2002. The IMF imposed severe austerity measures, as usual. That’s its basic anti-labor policy, so Argentina’s decision to return to the IMF has triggered huge national protests over the past few weeks. Despite this being the biggest loan in IMF history, we don’t really hear anything about it in the US media, except for the typical brief reporting in the financial press. There’s no real political or economic analysis of this especially on the Left, which one would think would be more sympathetic to the Global South, as well as countering IMF austerity philosophy. Before we get into the current massive deal with the IMF – you are one of the world’s leading experts on IMF and World Bank loans. When you were at Chase Manhattan Bank’s economic research department, your role was a balance of payments specialist, and your task was to establish the payment capacity of Argentina, Brazil and Chile. To give people a general understanding of the historical context leading up to what’s going on today, can you give us some history about the last Argentine economic crisis in the early 2000s, and the IMF’s role at that time? Michael Hudson: The reason there is so little discussion of Argentine or other Third World debt problems is that hardly anybody studies balance of payments (BOP) any more. There’s no course in balance-of-payments accounting or even in National Income and Product Accounts (NIPA) at any U.S. university. The right-wing Chicago School propagandists keep claiming that if a country’s currency is depreciating, it must be because its prices are going up. But that gets the line of causality inside out. For debtor countries such as Argentina or other Latin American countries, the balance of payments has little to do with domestic prices, domestic wage rates or domestic cost of production. The balance-of payments – and hence, the exchange rate – is swamped by debt service. Debt service is paid on what’s called Capital Account. Politically, government debt denominated in dollars is run into by these countries to cover their trade deficit that results from structural factors, such as their agreement not to grow their own food but to rely on U.S. grain exports, and to let U.S. investments in their countries avoid paying taxes. These are structural factors, not wage and price factors. Argentina is the poster child for countries that have totally screwed up their economy. Their predatory right-wing oligarchy has managed to steer their country from the most prosperous in the world in the late 19th century to one of the the poorest and most debt-strapped countries. This is a political problem. But the oligarchy blames labor and says that it has to be paid even less. In 1990, I helped organize the first Third World bond fund. It was issued by Scudder, Stevens & Clark. At that time in 1989-1990 Argentina was paying 45% per year on dollar bonds. Brazil was paying the same. Now just imagine: 45% a year. That doubles your money in two years! No country can possibly pay that for long. But it was clear that the Argentine dictatorship – bolstered by a US-backed assassination program against labor leaders, land reformers and left-wing professors – would continue paying for at least five years. So that was the fund’s time frame. Despite these high interest rates, we weren’t able to sell the bond fund to any American or any Europeans. But Merrill Lynch, which underwrote the bond fund, sold all its shares in Latin America. The fund was organized and the Dutch West Indies, so it was an offshore fund. Americans (including myself) were not allowed to buy it. So who did buy it? The bond buyers turned out to be the wealthiest families in Brazil and in Argentina. I think I’ve discussed this before on your show. Argentina’s foreign debt was owned almost entirely by the domestic Argentine oligarchy – the very richest class. They moved their money out of domestic currency into dollars, buying dollar bonds because they knew that they were going to authorize the high interest being paid – to themselves, masquerading as “Yankee dollars”. This is the oligarchy that followed the 1973 US-Chilean military coup that assassinated Allende and installed Pinochet. The US mounted a mass assassination and terrorism campaign throughout Latin America. In Argentina it was called the Dirty War. The Americans came in and applied the Chicago School economic principle that you can only have a free market if you’re willing to assassinate labor leaders, land reformers and university professors. Tens of thousands of Argentine reformers were tortured and killed to put the oligarchy in power and slash taxes on high incomes. Their tax laws make Donald Trump look like a moderate. And like most financial elites, they took the money and ran, putting their takings offshore in Argentina dollar bonds. Politically they denounced Yankee bondholders for forcing huge debt payments at 45% a year driving the currency down, but the wealthiest families themselves were the “Yankees” who were actually collecting. The real American Yankees simply didn’t trust the Argentines! When Scudder went around and talked to US investors in 1990, they said that the Argentinian politicians are crooks, and were not going to invest in a kleptocracy whose intention was to cheat us just like they cheat their own people! Now, fast forward to 2001. The IMF came in and followed US Defense Dept. and State Department directions to support the oligarchy and its terrorists. The CIA feared that otherwise Argentina might have a democracy as the wave of “free market” assassinations had died down. The IMF staff saw that it was obvious that Argentina was unable to take on any more debt. Nonetheless, they lent Argentina enough money so that the wealthiest Argentines could have a high enough exchange rate for the Argentine peso to take their money out of the country and move into dollars. It was a huge subsidy for capital flight out of Argentina into dollar-denominated Argentine debt to the IMF and other bondholders. Already in 1965 at Chase Manhattan I had done an analysis of Argentina’s balance of payments and hence its ability to pay debt service. My job was to calculate how much foreign currency Argentina could afford to borrow? First, I calculated their export capacity and their import needs. They’d agreed to buy from America and to become dependent. I found that Argentina already was paying all the debt service that it could, so it couldn’t afford to borrow any more. For almost half a century the country had been limping along. The IMF staff must have made a similar analysis, but its US-appointed board overruled its internal economic staff. It’s as if they operate out of a subbasement in the Pentagon and w do whatever they’re told. So the IMF lent the money to support the oligarchy and its capital flight. This was basically what the US/IMF also did in Russia. When Argentina issued foreign dollar bonds, it signed an agreement whose language was ambiguous, saying that it to treat everybody with parity. As you know, my book Killing the Host has a chapter on Argentina’s foreign debt. The vast majority of bondholders agreed to write down this debt to an amount that realistically could be paid. But a few years ago an almost senile American judge ruled in favor of the hedge funds, saying “parity” meant payment in full, not subject to the agreed-upon writedown. Judge Griesa said that a debt is a debt, even though the majority of Argentines had written it down. So the vulture funds cleaned up. The result today is that Argentina is as strapped as Puerto Rico, Greece or the Ukraine. It can’t possibly pay its foreign debts, so bondholders are dumping its bonds and the currency is plunging. The reason is not because it’s importing more, and certainly not because its wages are high. They’re very low, because as I said, the police state assassinated the main labor union leaders. The IMF sets terms on its loans: You cannot give labor unions power, and you have to privatize your industry (that is, sell it off to US and other foreign investors). You have to put the class war back in business with a vengeance. That’s how we got to the situation were the IMF lent enough money so that any wealthy Argentine families can convert their pesos into dollars. This capital flight leaves the economy empty and strapped. That’s the IMF’s “free market” philosophy. The situation is going to get worse in the coming months, not only for Argentina but for other Latin American countries. The main problem is that in the United States, the Federal Reserve is raising interest rates. It’s worried that there’s full employment, and its job is to keep wages low. The Fed thinks that the way to lower wages in the United States is to raise interest rates to deter new investment and employment, except at minimum wages or “gig” rates. Raising interest rates for the US economy means that the dollar’s exchange rate will rise against foreign currencies. It’s going to take many more pesos or other third world currencies to service their dollar debt. That means foreign countries are suddenly going to owe more for their foreign currency debt. That’s another reason why private capital is being moved out of Europe, Latin America and Asia into the dollar. Investors can make more money securely by buying U.S. government bonds than they can any other way, because the international financial system is looking very shaky right now. That’s why we have an inverted yield curve in the United States: short term rates are higher than long-term rates, because “savers” (a.k.a. the One Percent here and abroad) are parking their money in liquid U.S. Treasury IOUs. If the Federal Reserve actually goes ahead with its policy of raising interest rates, this will force defaults on the part of countries that owe their foreign debts in dollars, because the hard currency is becoming more expensive relative to the soft currency of debtor countries. Paul Sliker: As you mentioned earlier, it’s just amazing that for the IMF, the term “never again another Argentina” became its motto many years ago, and was actually cited by the European Desk economists who walked out when the IMF made its awful loan to Greece. The IMF acknowledged that Argentina’s debt was not payable. So to be a bit more clear about what you think is going to happen this time around with this massive $50 billion loan agreement, is it simply going to bail out speculators in Argentine bonds? Michael Hudson: Not only speculators, but the domestic oligarchy of bondholders, landowners and corporate owners. The wealthy Argentinans who deal with foreign banks want to keep their money offshore, in currencies other than the peso. They realize that the game is over and that it’s time to take the money and run. Paul Sliker: Jjust to be really clear here in comparison to the 2001-2002 situation, what is this going to do specifically to the Argentinian people as a whole this time around? Michael Hudson: The same thing that it’s done to the Greek people and the Puerto Rican people. Many will try to emigrate. Some will commit suicide. Lifespans will shorten. The standard scenario is what happened to Russia under neoliberalism in the 1990s. There is little the Argentine people can do, because the President essentially works for the U.S. commercial banking system and has let the IMF put pressure on Argentina. He has stopped the domestic subsidies for gasoline and the price of oil and gas to domestic producers. Basically he’s taking away social subsidies in general. It’s a classic neoliberal austerity program. Argentina is following the Donald Trump program of balancing the budget by cutting back its social programs. So the reason that Argentina should be interesting to your audience is that it looks like the future of the U.S. What is happening to Argentina is what Donald Trump – and before him, President Obama – want to do to the U.S. economy. Paul Sliker: That’s the question I was just going to ask you. As we’re closing this conversation out, Michael, maybe you can expand on that. I think some people generally know that the central theme of Latin America for decades is that U.S. economic and foreign policy deploys the IMF and World Bank to back creditors, foreign investment, and privatization. But why exactly should people care here in the U.S.? I know you started to explain that. But dig a little deeper for us there. Michael Hudson: What really is at issue is whether all debts should be paid, or not? I think that there should be an international rule that no country should be obliged to pay its debts to the wealthy One Percent, especially to a creditor class that prefers to hold its domestic wealth offshore in foreign currencies. No country should be obliged to pay its bondholders if the price of paying means austerity, unemployment, shrinking population, emigration, rising suicide rates, abolition of public health standards, and selloffs of the public domain to monopolists. To make matters even worse, the privatizations demanded by the IMF and World Bank, for instance, will sharply raise the prices for what had been public services, transportation, water and sewer, communications, and telephones. There should be principle that the domestic people should come before foreigners. But the guiding principle of the IMF, World Bank, and the United States the opposite: namely, that no nation should put its own interests first. Instead, every nation is told to put the interests of international creditors first, even when the cost is impoverishment, dependency, mass poverty and deindustrialization. This is what globalization really means today. It’s an international imposition of class war by the creditor One Percent against labor and the indebted 99 Percent and their governments. The madness of this was spelled out over 2000 years ago. In Book I of Plato’s Republic you have Socrates arguing against the idea that all debts should be paid. He asks, what if you borrow a weapon from a crazy person, and he asks for it back. Should you give him a weapon if he’s likely to hurt people? This applies to creditors in general: Should you pay off debts if the creditors are going to use their money to impoverish society and reduce people to debt dependency? That’s what the Republic is all about. We’re still dealing today twenty four hundred years later with the same issue. The issue is: what should come first: the people’s welfare, or that of creditors? I want to let everyone know that we’re sorry we haven’t been able to keep up with our weekly episodes of The Hudson Report. Michael’s been very busy getting everything together with the book I just mentioned, and he’s just got back from a trip to Europe. Now that he’s back, we can get back to our regular weekly schedule. But for now, as always Michael, thank you for joining me on The Hudson Report. Michael Hudson: It’s always good to be here, Paul.